Oatmeal Pancakes are easy to make and a more filling than your typical pancake recipe. The batter comes together in just 5 minutes with ingredients you probably already have on hand! Pancakes are a classic breakfast option. If you want to make a more filling pancake that keeps you full longer, try making oatmeal pancakes. The batter can be made a head and kept in an airtight container in the fridge for 3 to 5 days. Just give it a quick store before cooking up your pancake batter for a quick and hearty breakfast the whole family will love. 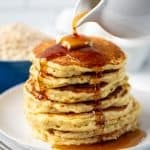 What are the best kind of oats to use to make oatmeal pancakes? 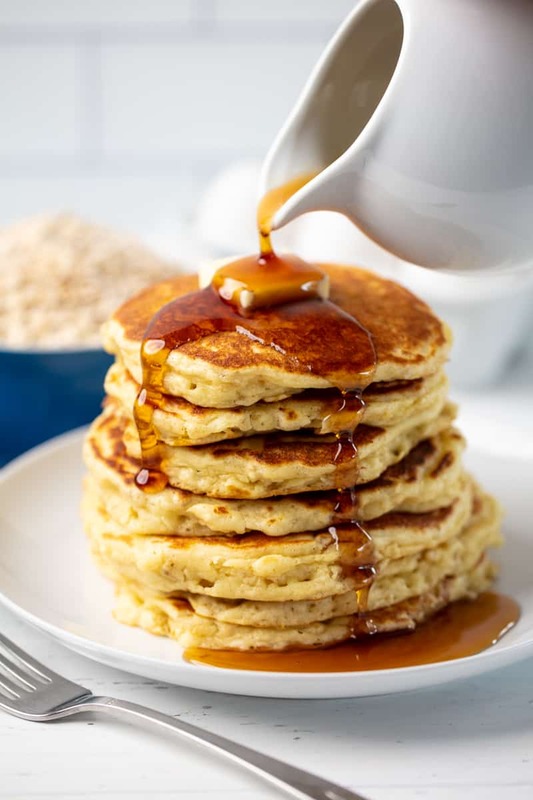 Oatmeal pancakes can be made with either quick oats (instant oats) or old fashioned rolled oats. The quick oats will have hardly any texture and you may not even notice they are there. Rolled oats will have more of a texture in the pancake. We do not recommend using steel cut oats to make pancakes as they will have an unpleasant chewiness. Yes! Whole wheat flour can be used interchangeably in this recipe. Please keep in mind that the use of whole wheat will make for a more dense pancake. You can use partial whole wheat to retain a bit of fluffiness. Can I use oat flour in this recipe? Yes, for a fully oatmeal based pancake, you can use oat flour in this recipe in place of the all-purpose flour. This will change the overall texture of the pancake, but it will still be enjoyable and delicious. To make your own oat flour at home, simply process oats in a blender or food processor until pulverized into a flour substance. In a large mixing bowl, stir together flour, quick oats, sugar, baking powder, baking soda, and salt. Whisk in buttermilk, eggs, and melted butter just until combined. Cook other side until golden brown. Serve hot with syrup. Super quick to throw together. My family loved them! They are fluffy and the addition of the oats gave it a great depth of flavor. This is my new go to pancake recipe. We love pancakes and have enjoyed your pumpkin, blueberry, and plain ones, but this one became our new favorite! Thank you for the great new recipes. Your website has become our go to recipe box! This is a wonderful recipe…my husband ate 8 of them!! Thanks Rachel! I added a splash of my homemade vanilla and some Penzeys Cake Spice. Delish! Buttermilk is not that easy to obtain here in the UK, especially where we live so alternatives would be useful. If I don’t have buttermilk on hand, can I add some.vinegar to my regular milk? If so, what’s the ratio between milk & vinegar for this recipe? Thanks!